Really pleased that our 'Anyone Can Be a Star' song has been scheduled as our new single, out 12 March. You can stream it on Spotify here, and the press release is below. The idea behind Five Grand Stereo is to take a 1970s band, shove it in a time machine, deposit it in 2018 and ask its members to make a record about the world they find themselves in. The result: darkly humorous, occasionally theatrical songs with huge choruses. 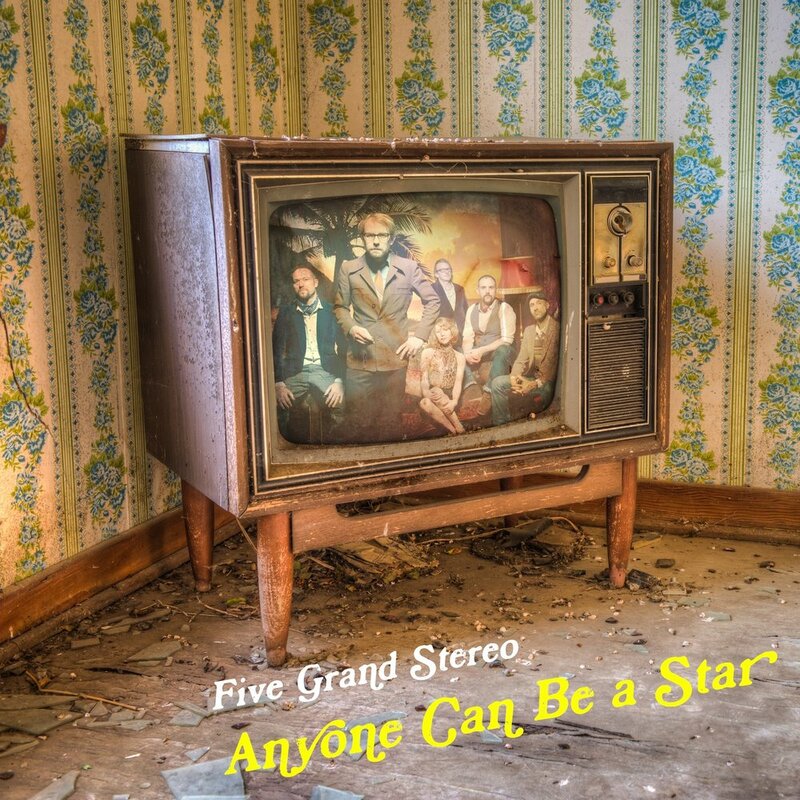 Their new single Anyone Can Be a Star sums up what Five Grand Stereo are all about. Three-part harmonies, dueling guitars, big string lines, punchy brass and above all, soaring melodies abound. Classic artists like Marc Bolan, Bryan Ferry, Frank Zappa, Lou Reed, The Beatles and David Bowie are referenced sonically, but put through Five Grand Stereo's proprietary blender to create a uniquely memorable track (about a young female singer’s experience on a slightly jaded reality TV show). With a healthy dose of cynicism running through its veins, Anyone Can Be a Star conjures up the sounds of 1975…to take a pop at post-truth 2018. Five Grand Stereo are Chris Singleton (vocals, guitar, piano); Jane Fraser (vocals); Stelios Kalisperides (guitars); Michael Kirkland (sax and synths); Zane Maertens (bass) and Ben Woollacott (drums). The band are based in London but have a strong Irish contingent: Chris hails from Dublin, and Jane is from Limerick. Five Grand Stereo play The Grand Social, Dublin on 10 April and Dolan’s, Limerick on 11 April as part of a series of UK and Ireland dates. See live section for more information. Press: [email protected] / 087 2435048.